Water treatment plants across Australia form an important part of Clark Industrial’s business. 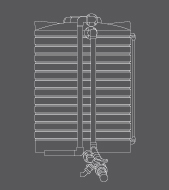 We supply all the major companies that specialise in water treatment plants. Clark Industrial has a wealth of knowledge in the fabrication of industrial tanks for treatment plants. Our people understand the demands on companies to complete large projects within certain time frames and to the highest standards. At Clark Industrial, we pride ourselves on our quality workmanship and have invested in highly skilled tradespeople to perform all our industrial tank fabrication. Clark Industrial provides excellent service, maintaining open communication with you to ensure that all our tanks arrive on time and are fabricated to your exact specifications.